Newtown’s Andre Sokk defends during a game against Stepinac on Saturday. 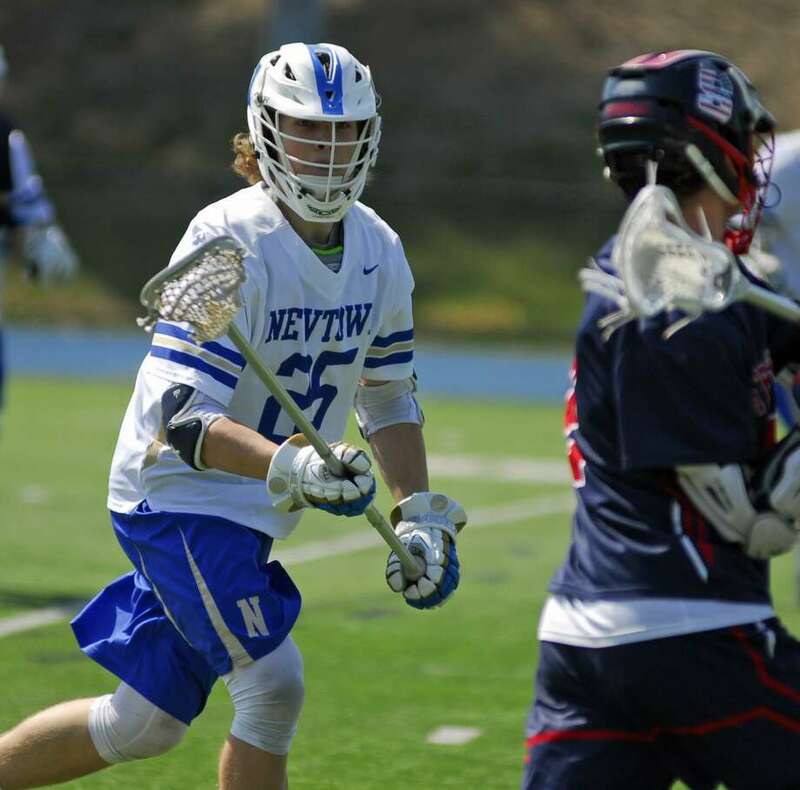 NEWTOWN — For most of its game against New York opponent Stepinac, the Newtown boys lacrosse team proved it could go toe-to-toe and match goal-for-goal. Unfortunately for the Nighthawks, an early hole was too much to overcome against an offensive juggernaut. The Crusaders didn’t let up in the offensive zone, scoring 10 times in the first half to claim a 16-12 win over Newtown Saturday afternoon. The Nighthawks dropped to 4-2 with the defeat to the school from White Plains; Newtown is 4-0 against the SWC so far this season. Newtown fell behind 8-3 in the second quarter as mistakes led to turnovers and turnovers led to goals. Stepinac scored four straight goals during the stretch as the Nighthawks were stifled. The Nighthawks — despite fielding and getting contributions from several freshmen — refused to crumble and closed to within two goals on several occasions in the second half. Evan Eggleston scored with 3:37 left in the third to pull Newtown to within 11-10. Layton Harrell led the Nighthawks with four goals while Tucker Garrity added a hat trick. Stepinac had the final say, scoring three straight goals to seal the game as a pair of standouts carried the load on offense. The Crusaders boasted several Division-I commits on the field, including sophomore Colin Sharkey (Vermont) and seniors Daniel Rodriguez (Sacred Heart) and Lonnie Jones (Hampton). Rodriguez dominated in the faceoff circle for Stepinac, which was coming off a 11-10 win over rival Scarsdale a day earlier. Jones scored six goals while Sharkey scored four times and dished out three assists. Records: Stepinac 5-2, Newtown 4-2. Scoring: S—Lonnie Jones 6g, 1a; Colin Sharkey 4g, 3a; Kevin McKenna 1g; Joey Carino 3g, 1a; Kevin Rafferty 1g, 1a; Danny Rodriguez 1a. N—Jeff Garrity 1g, 1a; Tucker Garrity 3g, 1a; Layton Harrell 4g; Evan Eggleston 2g; Brandon Manka 2g. Goalies: S—Tyler Rispoli (10 saves); Dylan Graff (0 saves); N—Jake Dandrea (9 saves).